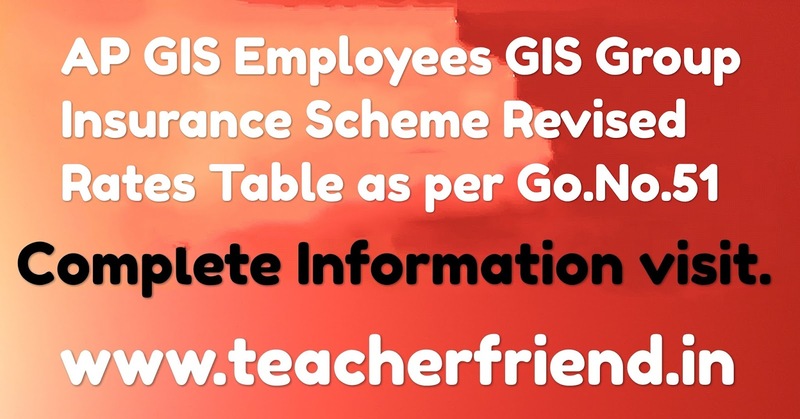 AP Employees Group Insurance GIS Revised Slab Rates Table/Andhra Pradesh State Employees Group Insurance Scheme 1984 Revised Rate of Interest on Accumulated Savings Fund Communication of Tables of Benefits for Savings Fund for the Period from 01-01-2018 to 31-03- 2018 – Revised Tables as per G.O.MS.No. 51 Dated: 24-04-2018/AP GIS Employees Group Insurance Scheme Revised Rates Table as per Go.No.51. for the Period from 01-01-2018 to 31-03- 2018 – Revised Tables as per G.O.MS.No. 51 Dated: 24-04-2018. G.O.Ms.No.293, Fin. & Plg (FW-Accts.II) Dept., dated: 08-10-1984. G.O.Ms.No.312, Fin. & Plg (FW-Acmn.II) Dept., dated: 06-11-1984. G.O.Ms.No.367, Fin. & Plg (FW-Admn.II) Dept., dated: 15-11-1984. G.O.Ms.No.13, Finance (Admn.II) Department. Dated: 24-01-2017. G.O.Rt.No.318, Finance (HR.5.Pen.GPF) Dep., dated: 22-02-2017. G.O.Rt.No.1171, Finance (HR.5.Pen.GPF) Dep., dated: 11-15-2017. G.O.Rt.No.2087, Finance (HR.5.Pen.GPF) Dep., dated: 31-12-2017. G.O.Ms.No.111, Finance (Admn.DI&IF) Dep., dated: 11-07-2017. G.O.Ms.No.122, Finance (Admn.DI&IF) Dep., dated: 19-07-2017. G.O Rt No .96 Finance (HR -5-Pension, GPF), Dep., dated: 24-1- 2018. In the reference 1st read above, orders were issued introducing Group Insurance Scheme to the State Government Employees in place of Family Benefit Scheme with effect from 01-11- 1984 .according to Para 9 of the reference 1 st read above, the accumulations of savings fund part and insurance fund part shall carry interest for the rated prescribed by Government from time to time. the ratio of Rs 3.125 paisa and Rs 6.875 paisa respectively. held responsible for sanctioning the Group Insurance Scheme final payments. The Drawing and Disbursement Officer shall recover the correct rate of Subscription according to the eligible group of employees. For any excess / less recovery, the Drawing and Disbursement Officer concerned shall be held responsible. The Director of Insurance, Andhra Pradesh, Amaravati ,Ibrahimpatnam shall conduct a regular Audit of all claims paid under Group Insurance Scheme and send a report to the Head of the Department concerned. Any excess payment made, if found during the Audit by the Directorate of Insurance, the same shall be immediately recovered from the concerned and remitted through Challan to the concerned Head of Account by the Drawing and Disbursement Officer and the fact of remittance shall invariably be communicated to the Directorate of Insurance. If an employee’s subscription at any period if not recovered during his Service the total subscription along with interest shall be recovered from the payments admissible to him. the Scheme at the appropriate rates have been recovered for the period from April to March. The entries shall be attested by the Drawing and Disbursing Officer. “Sanctioning authority shall send a copy of sanction orders of the Group Insurance Scheme Payment including calculation slip to the Directorate of Insurance for verification”. In view of the above circumstances stated above and after careful examination of the matter, File No.1690/138/A1/Admn .DI&IF/2016 Government hereby order that, the revised rates of interest on the Andhra Pradesh Group Insurance Savings Funds shall be allowed at 7.6% per annum as per the G.O Rt No.96 Finance (HR -5- Pension,GPF),Dep., dated :24-1-2018 and The Table for GIS subscription and with accumulated interest is issued for the periods covering from 01-01-2018 to 31-03-2018. Further, it is ordered that instructions prescribed at Para 4th above, should be followed scrupulously. The revised Table is annexed below.